Jon Whelan’s Stink! is the kind of film that keeps you on the edge of your seat. Though a documentary, its feels very much like a thriller and/or suspense film, but not in the traditional sense. While heightened emotions, uncertainty, tension, excitement and surprise twists are all a part of the Stink! experience, viewers aren’t emotionally evolved over a fictionalized character, but are rather invested in a single father that is very much like them. In fact, viewers later realize that the vicious cycle Whelan is up against, is the same battle they’re fighting every single day, whether they’ve realized it or not—the battle for their lives. What begins as a simple question ends up as a full on fight against the chemical industry. Surprisingly, it all begins with a pair of kids pajamas Whelan purchases for his daughters. When the package arrives he notices a foul smell. Attempting to identify the smell, Whelan is thrust into the very ugly realities of an industry that affects everyone but is loyal to none. What he uncovers is a process marked by trade secrets and a billion dollar fragrance industry that uses hundreds of thousands of potentially harmful chemicals. With no regulatory laws demanding these chemicals be disclosed, Americans are exposed to these substances on a daily basis, many of which are linked to illnesses such as asthma, cancer, obesity and infertility. In essence, our bodies are being genetically modified by chemicals that are protected by laws such as the Toxic Substances Control Act, which allows manufacturers to legally use over 80,000 chemicals that have been “grandfathered” in various legislation. Stink! Domestic Festival Trailer from NetReturn Entertainment on Vimeo. 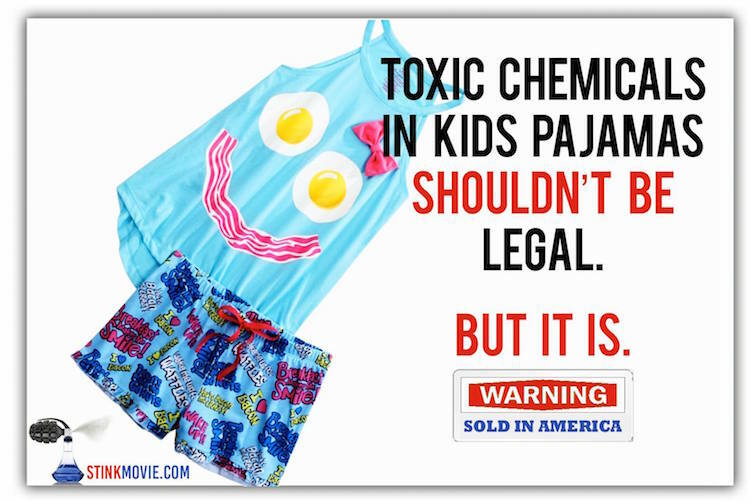 Throughout the film, Whelan tracks down politicians, industry professionals, and owners of stores who sell household products containing toxic chemicals to find out what’s really in our shampoo, deodorant, shower cleaner, perfume…the list goes on. Along the way, he exposes the unethical practices of trade associations – organizations founded and funded by businesses that operate in the chemical industry – which ghostwrite the legislation that is supposed to regulate them, influencing the political process and guaranteeing continued funding. “I used to be ignorant about the Cancer Loophole. I thought that if a product was on the shelf in a store that meant it was safe. I naively believed that if a product contained dangerous, toxic ingredients, ingredients that could cause cancer, that product would be banned,” says Whelan. Stink! explores the many ways, this is not true—and ignorance, most certainly is not bliss. It is a daily risk to the health of our bodies and a false promise of peace of mind. As Whelan works to undercover the inner workings of the chemical industry, he asks a simple question: if these chemicals are safe, why won’t manufacturers disclose them? It’s a question that resonates with viewers long after the film has ended. Currently, the film is on the 50 States of Stink! Tour with the documentary showing in 50 capitals in 50 states. You can find a complete list of the screenings here. The film is expected to be released on December 4 in Los Angeles, California. For more information visit www.stinkmovie.com.